Four years have flown by so quickly. I absolutely love sharing my recipes, tablescapes, family events and stories. The more members we have just makes the DishingwithDiane family bigger and better. I deeply appreciate every member. I wish I could thank each and every one of you in person for signing up to become a member and showing so much love and support for this blog. I hope that over the course of four years I have helped you in some way. Perhaps a new recipe that has become a family favorite or new ideas for your tablescapes for parties and holidays. Whatever it is, it has been a labor of love for me. 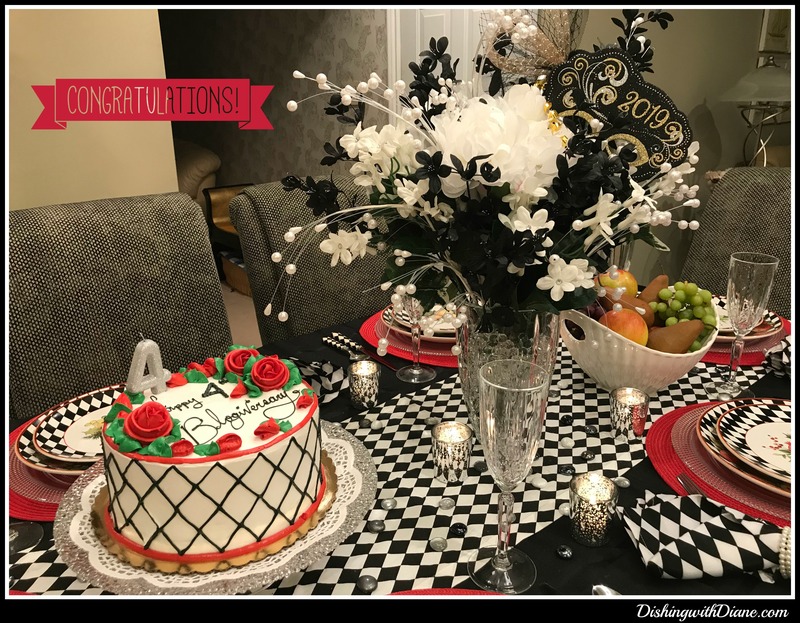 Please continue to ask your family and friends to like, share, comment and join DishingwithDiane, as we head into year number Five. I knew from the day I bought these dishes that I wanted to use them for my 4th anniversary tablescape. They are pretty versatile. They can be used for any winter celebration and even for a Christmas luncheon. 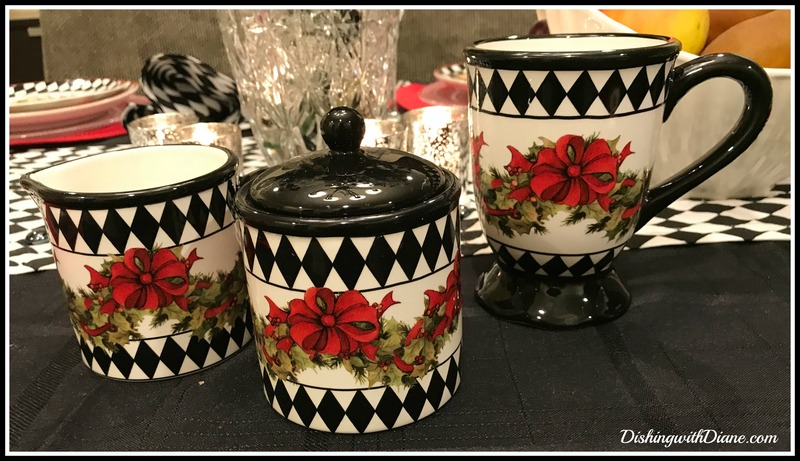 I think what attracted me to these dishes was the black & white harlequin pattern, absolutely one of my favorite patterns. And they are designed by one of my favorite artists, Susan Winget. I have been obsessed with black and white in fashion and home decor for many years. I think I fell in love with the bold look of black & white once I saw My Fair Lady and they had the Black and White Ball. 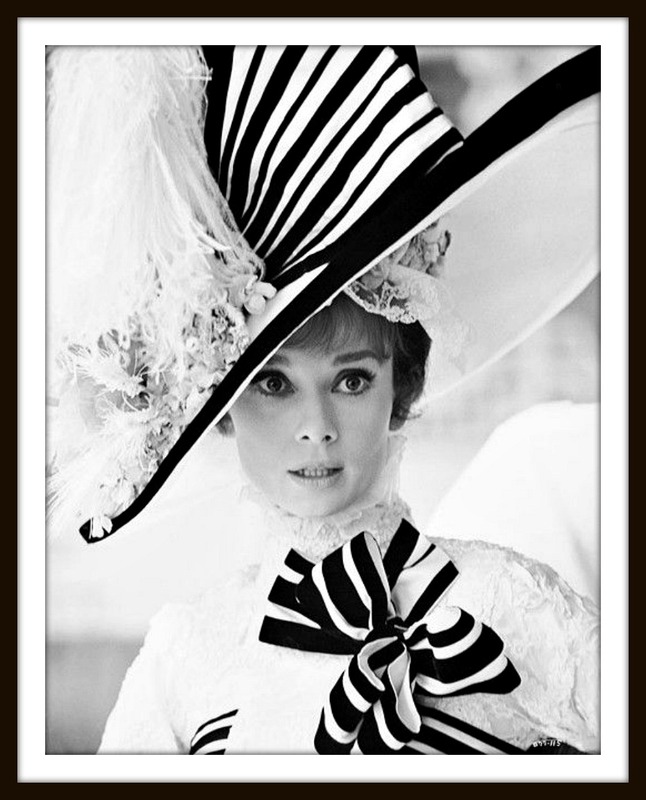 Does anyone remember seeing the movie and how stunning Audrey Hepburn looked in this ensemble? She has always been a favorite actress of mine. 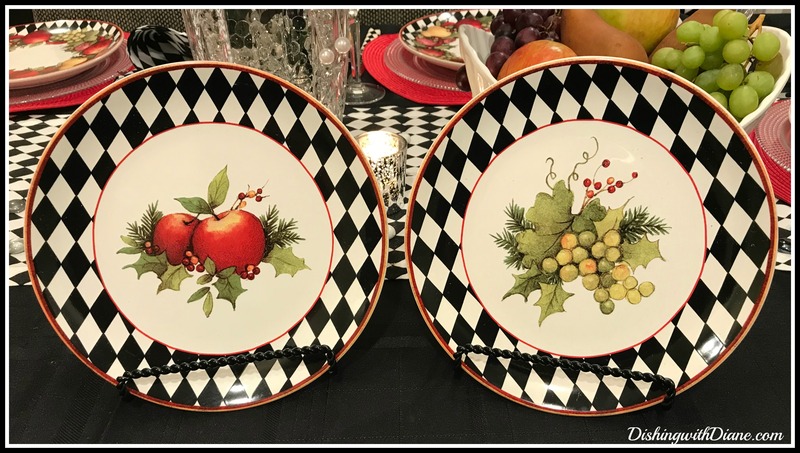 The dinner plate is very festive and it has the black and white harlequin pattern as the border with an accent of amber and burgundy at the edge of the plate. 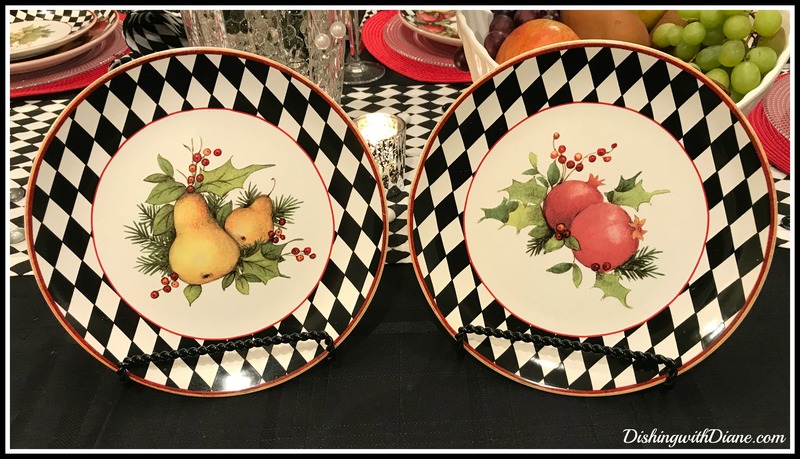 The center of the dinner plate is white framed in an array of fruits in tones of burgundy, amber and green finished with a red bow. Almost looks like a wreath of fruit. 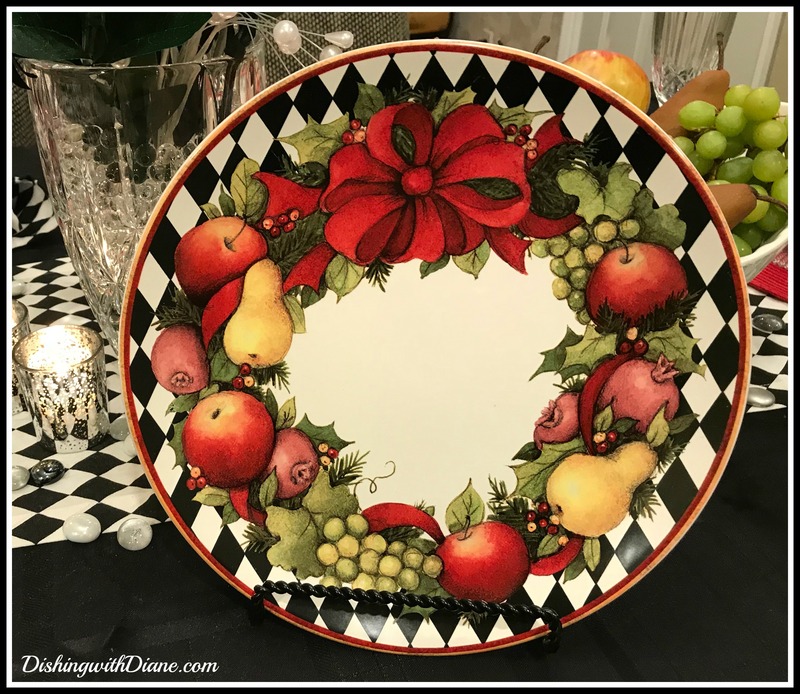 The salad plate also has the harlequin border with an amber and burgundy edge and each plate features one of the fruits displayed on the dinner plate in the center. Unfortunately for me this set does not come with soup bowls, only small ice cream bowls which I chose not to buy. I did purchase the mugs along with a small harlequin rectangular tray (12 X 6) with handles and the creamer and sugar bowl. 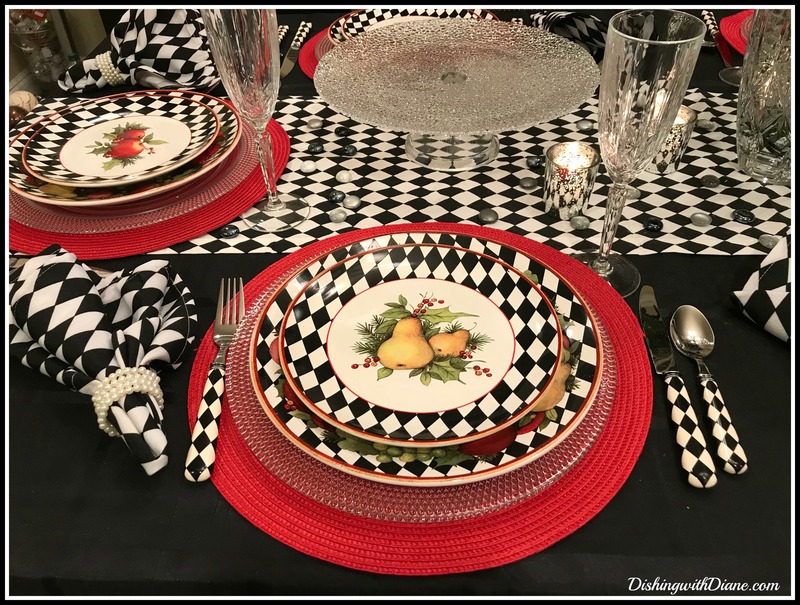 I am starting my tablescape with a solid black tablecloth with a woven square pattern. Very basic but I needed the pattern to add something to the table. I think a plain solid tablecloth would be too dull. 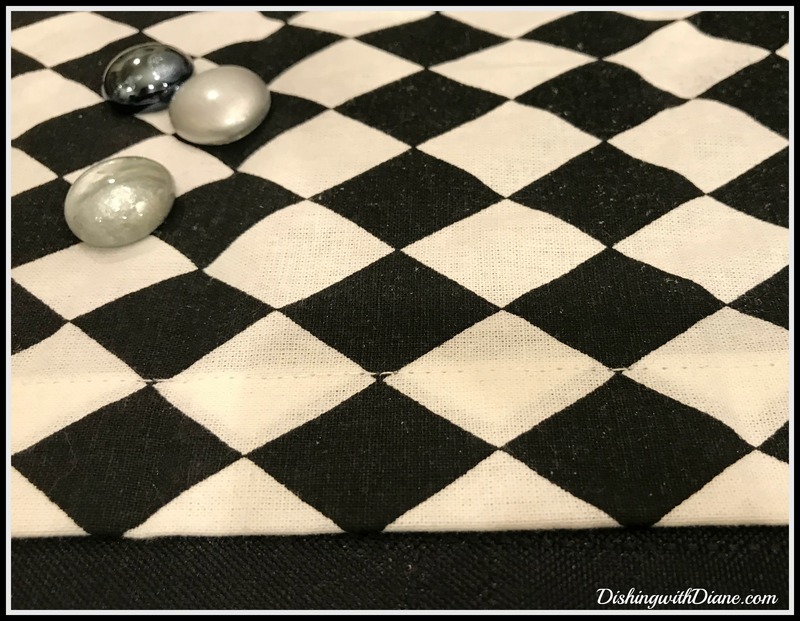 Along with the black tablecloth, I had to add my black and white harlequin table runner. I originally bought this table runner to decorate a table at Halloween for bowls of candy for trick or treaters. Now for the placemats and chargers. 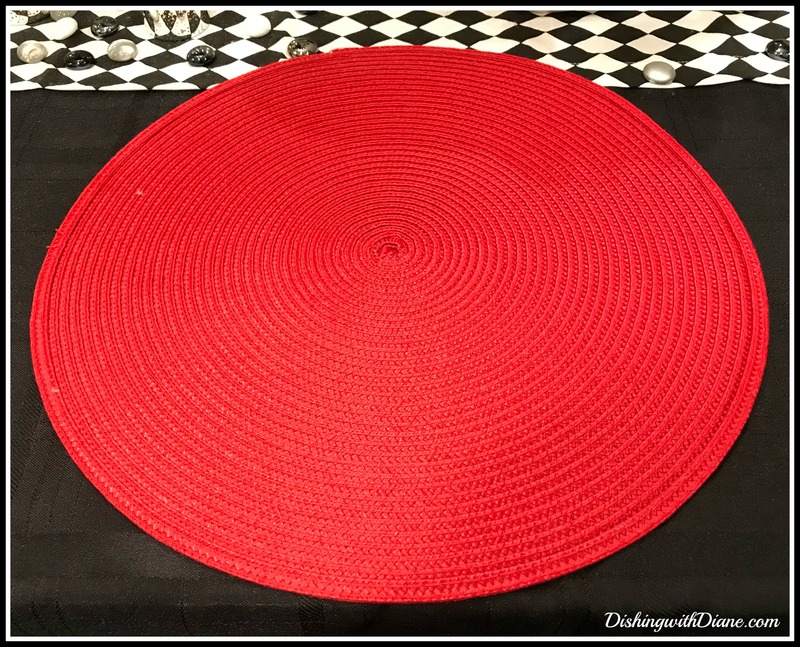 This tablescape needed an accent color from the plates, so I am using a red woven placemat. This will add a pop of color and match the bow on the dinner plate. I didn’t want to add any additional color to the tablescape so I am using clear glass chargers. They dress up the table without taking away from the table linens. When I purchased the table runner I also purchased the matching napkins and I am so glad that I did. 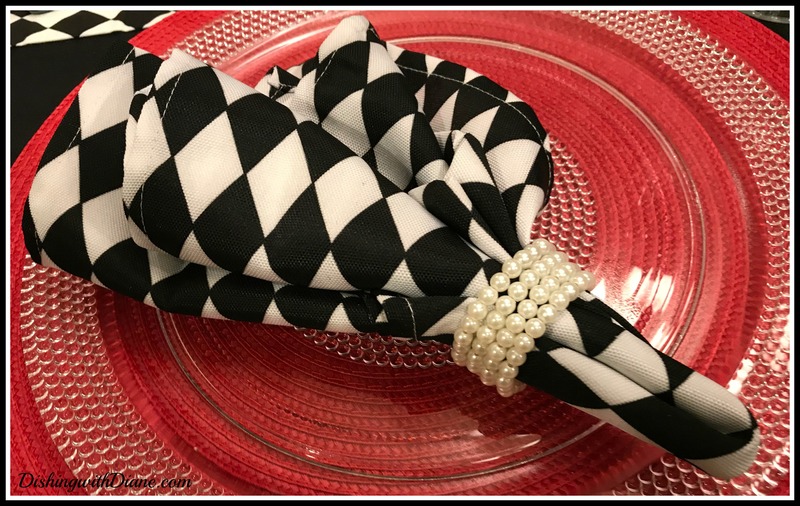 They work perfectly on the table and I decided to use a pearl napkin ring. 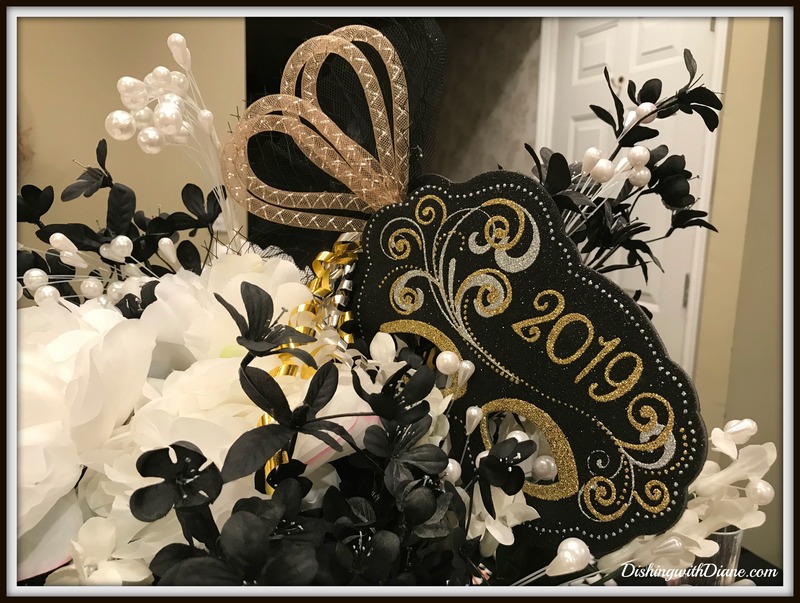 I love the combination and I am using pearls in my centerpiece. My flatware is absolutely fantastic! 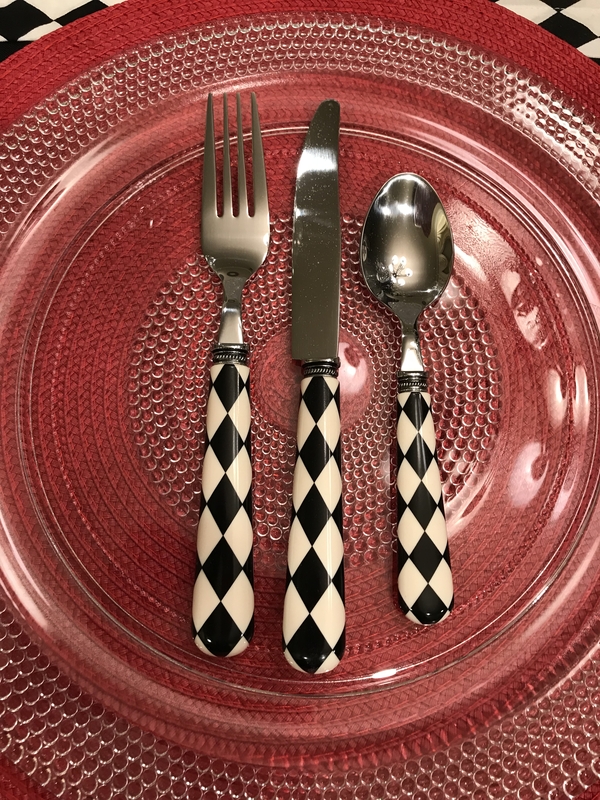 I was gifted this set of black and white harlequin cutlery and I love it. My son’s girlfriend gave me this set because she knows how much I love black and white and the harlequin pattern. There couldn’t be better flatware for this tablescape. Now the glassware. 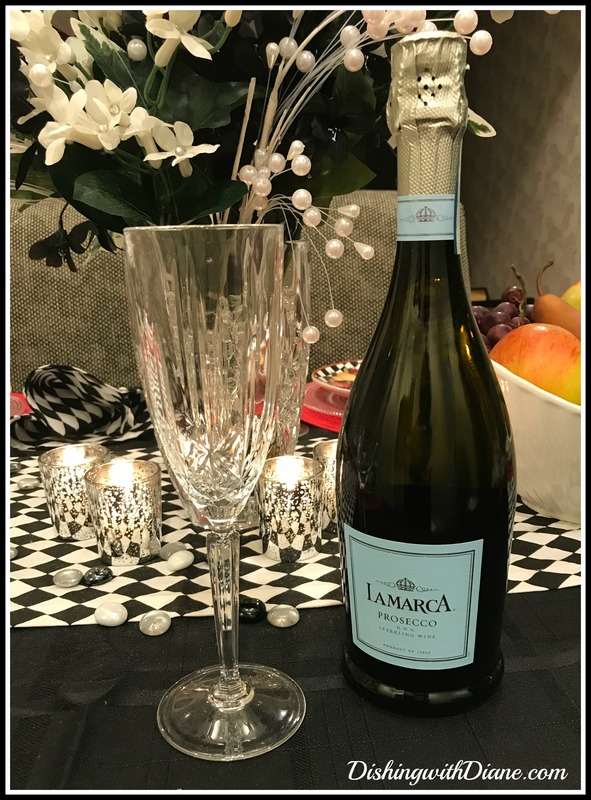 Since there is always a dessert and prosecco celebration for the anniversary, I am using my Waterford crystal flute glasses. 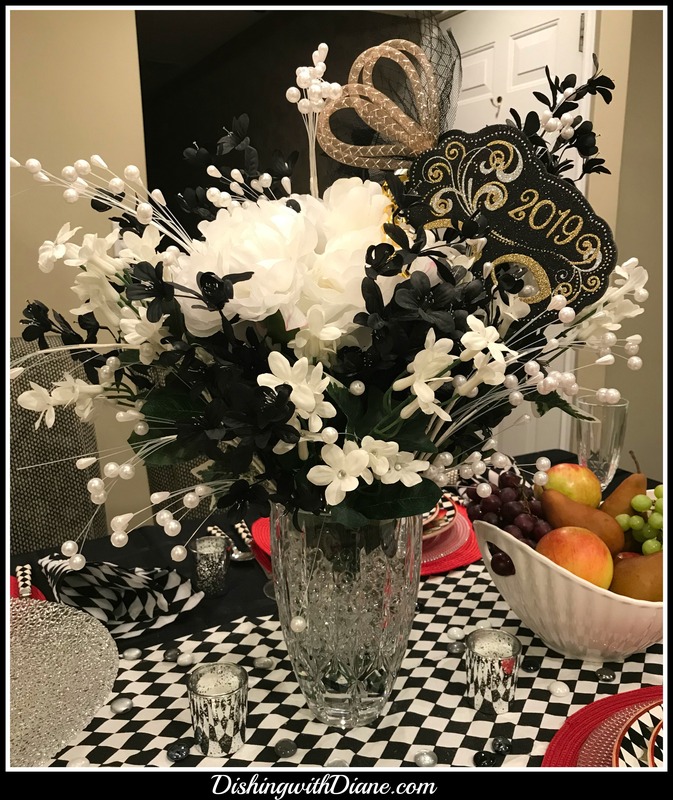 My centerpiece is the crystal vase that matches the stemware and I filled the vase with black and white silk flowers and a few pearl sprays to accent the flowers and coordinate with the napkin rings. For the first time I am using water jewels as a vase filler. These are water absorbing polymer that grows larger the more you hydrate them. 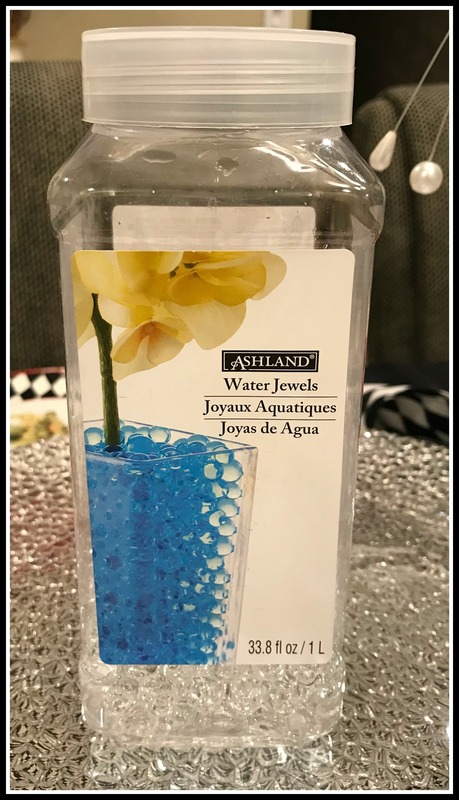 When the water evaporates the beads shrink and can be saved in an airtight container for another project. Normally, I would use these beads for fresh flowers, but I wanted to try them on silk to help the flower stems stay exactly where I wanted them. (Found at Michael’s Art’s & Crafts). 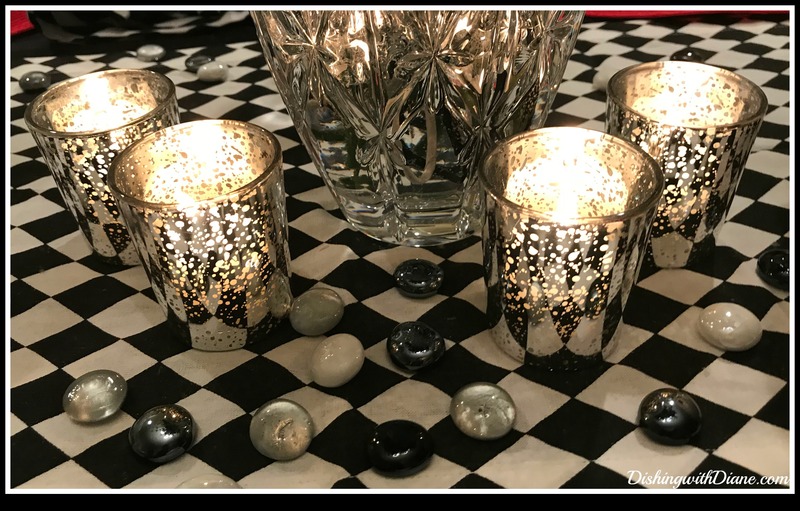 My table accents are candles of course and I am using mercury glass votive holders to complete the table along with black, gray and white glass gem table scatter. 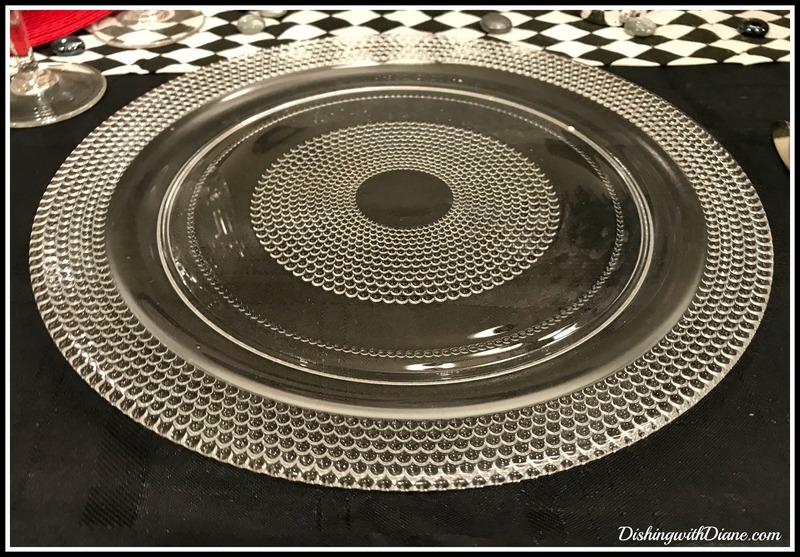 My cake stand is clear glass at the base with a crackled pattern for the cake stand top. It actually reminded me of the water jewels in the vase. Now, what is a celebration without a cake? This year I asked for a harlequin print on the cake and I had to go to two bakeries before anyone would accept the challenge. It seems that black frosting is a color that isn’t asked for very much. I finally found a bakery willing to try and I think they did a great job. I even kept the filling simple to make it easier for them- just yellow cake and chocolate pudding (can’t go wrong with basic). I wanted to add a second accent to the table and decided on some fresh fruit that was featured on the salad plate. 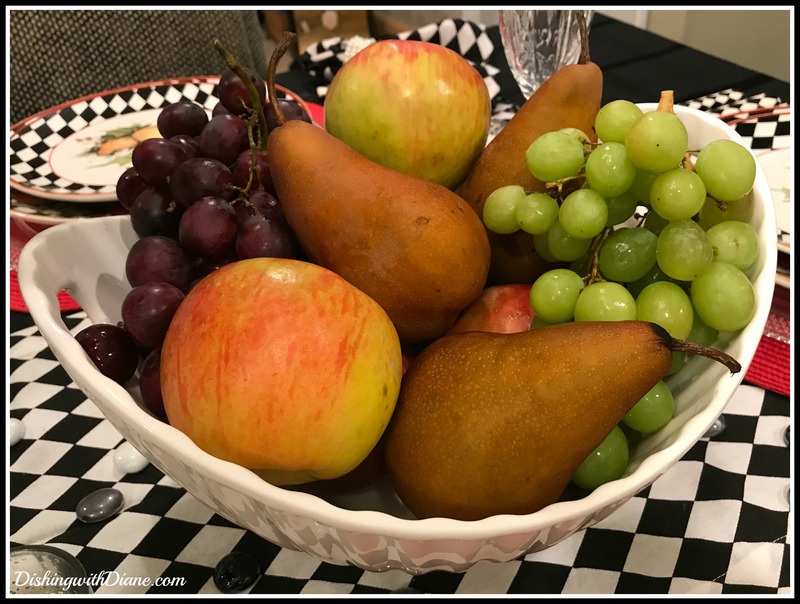 I used a white ceramic fruit bowl with pears, apples and grapes. (Bob said this looks like a painting). And now, Bob and I will have our traditional toast to another great year along with a toast to all the members of DishingwithDiane that make my dream of having this blog come true. 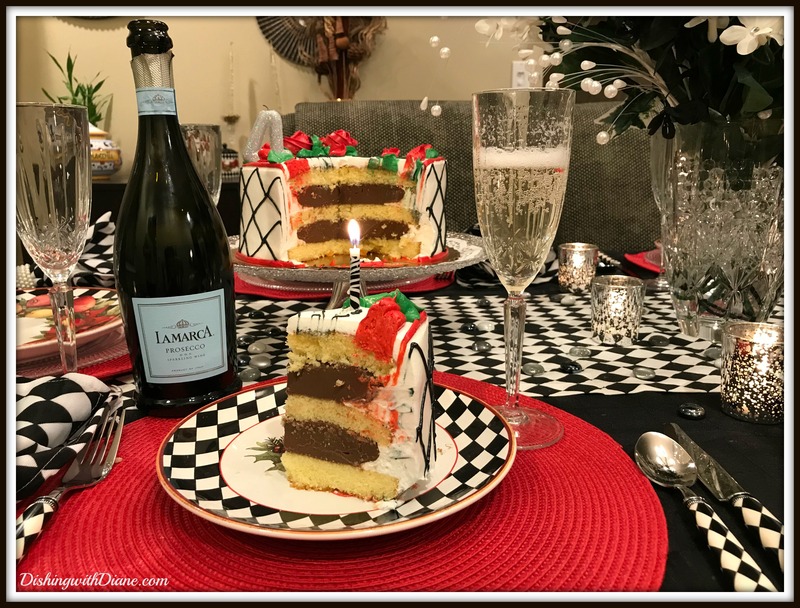 This entry was posted in Dishing with Diane Blogiversary on January 26, 2019 by aries041158. Thank you Nancy. 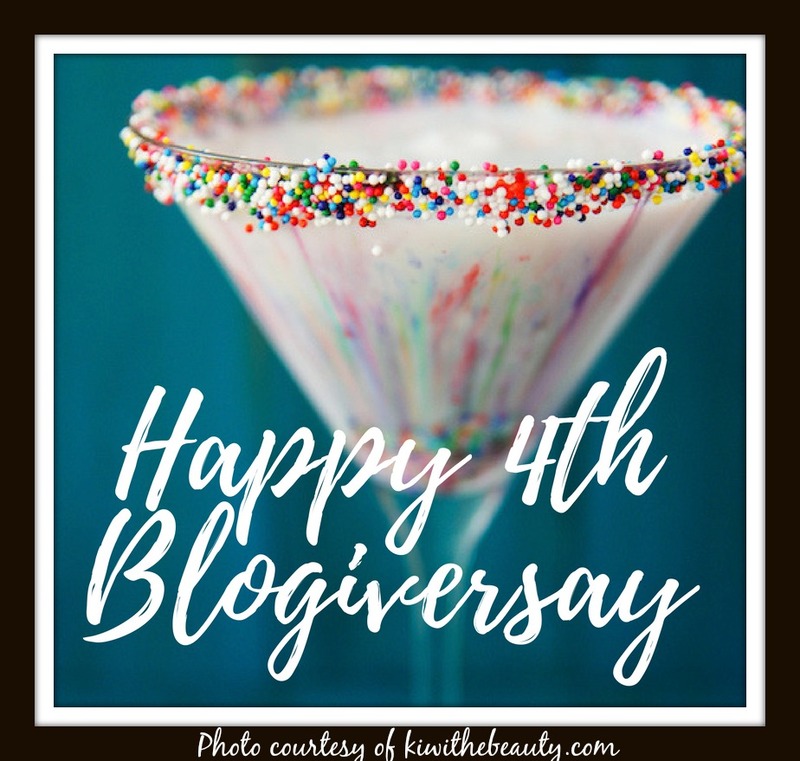 I can’t believe the blog is four years old already. I am looking forward to a lot more postings. Thank you for being a member from the start. Awe, thank you Loretta for such lovely compliments, you are too sweet. I am having a great time writing the blog and look forward to many more posts. Glad to love the dishes, they stopped me in my tracks. Stay well. 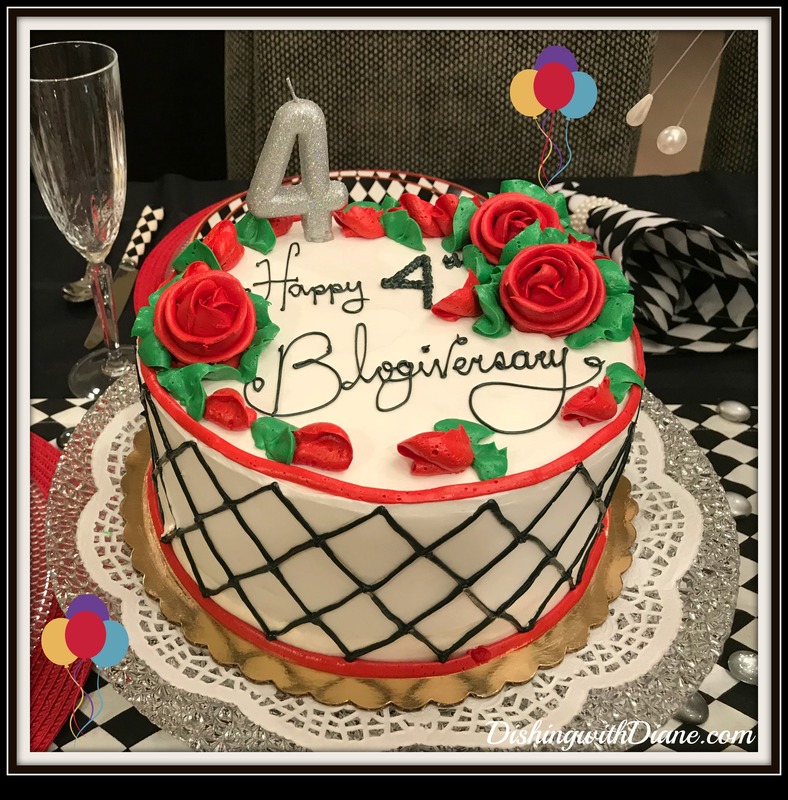 Happy 4 Year Blogversary Diane. If we lived near each other, I would have joined you for a toast and slice of that delicious cake!! 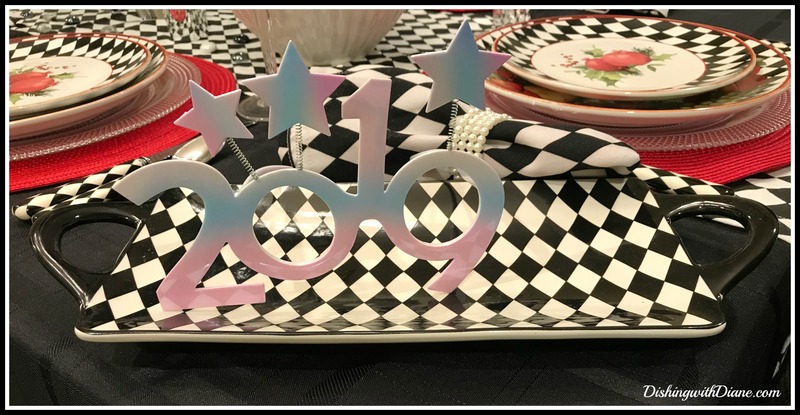 Looking forward to another Fabulous Year of your Gorgeous Tablescapes!! CHEERS!!! Thank you Ellie. I wish you did live closer, we would have a good time together. If you are ever in the neighborhood, you know you are always welcome. Stop in. Thank you Donna. I am so glad you like the blog. That makes it all worth while for me. 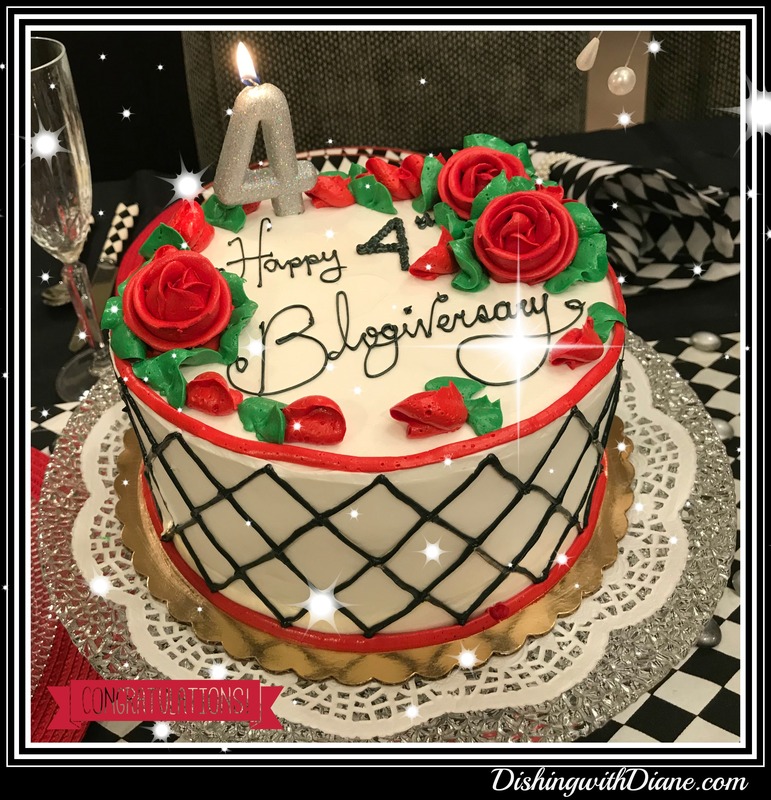 Happy 4 Year Blogiversary, Diane! I’m so proud of you and what you have accomplished! 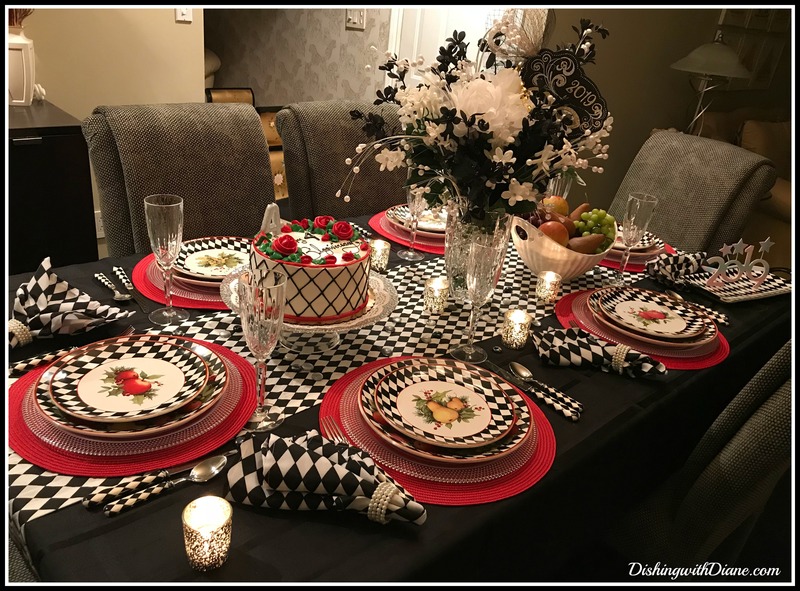 This is one of my favorite tablescapes! I also love black & white harlequin. Beautiful dishes and cutlery, red accents and the pearls! With my Audrey Hepburn to boot! Wishing you much more success to come. Thank you for all the joy this blog brings to me. Now eat that gorgeous cake, my friend!! Thank you Suzanne. It has been a lot of fun for me to continue writing the blog. Especially wonderful to put Audrey on such a special post. Thank you for all of your support over the years. Thank you Linda. WE are so glad we got back in touch with you as well. I really glad that you enjoy the blog and I want to thank you for all of your support over the years. Looking forward to many more posts. Happy, happy blogiversary Diane! Love, love, love your tablescapes and recipes. Here’s to another great year of festive food and tables! Thank you Ruth. I am so glad that you are enjoying the blog. It has been wonderful for me to write and share with so many. I am ready for another busy year. Thank you for all of your support. Happy anniversary!!!! This blog is outstanding. I enjoymalllif your creative blogs…keepmthem coming. Thank you Denise, happy to hear that you are enjoying the blog. That makes it all worthwhile. Thank you Jeanine, thank you so much for all your support over the years. Do you believe it’s been four years? I knew you would like the dishes, it’s so us.